The case of Trusted Clean Magnifico that comes in this package is a great floor cleaning solution, that leaves a lavender scent behind after cleaning. 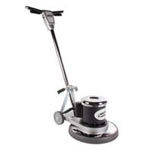 Works great on commercially tiled floors with our 17 inch floor scrubbing buffer, solution tank, a case of 17" scrubbing pads, and 17" polypropylene brush. We throw in the solution tank and brush for FREE when you purchase this package! The package also comes with a 20" high speed floor polisher, a case of 20" aqua polishing pads, a pump-up sprayer, and case of floor restoring solution. This will keep your tiles shining bright for a higher appeal to your customer base. The floor restorer can be used as a spray-buff, or it can also be mopped on beforehand, then burnished. Make sure to check out our other money saving floor cleaning package deals. Best Deal Review by It's a REAL Deal!